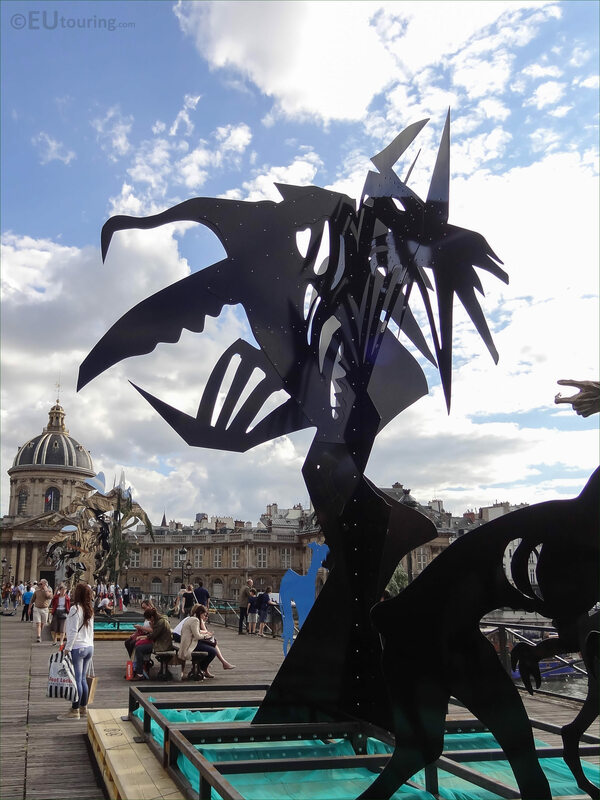 We were on the pedestrian bridge over the River seine called the Pont des Arts, when we took these high definition photos showing the black Arbre VI sculpture, which was produced by Daniel Hourde. 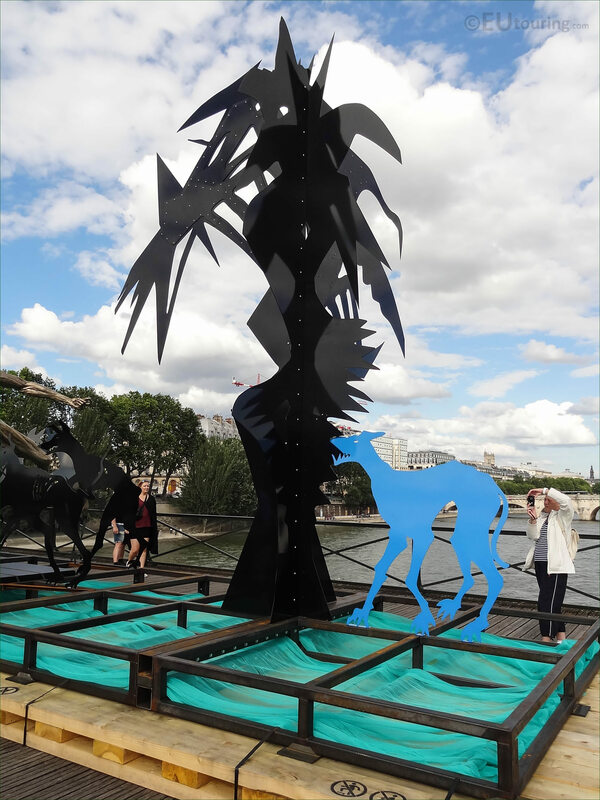 This first HD photo shows a contemporary art sculpture that was designed to represent a tree, and this is called Black Arbre VI, or Tree 6, and is one of ten trees that were designed for an exhibition called La Passerelle Enchantee. 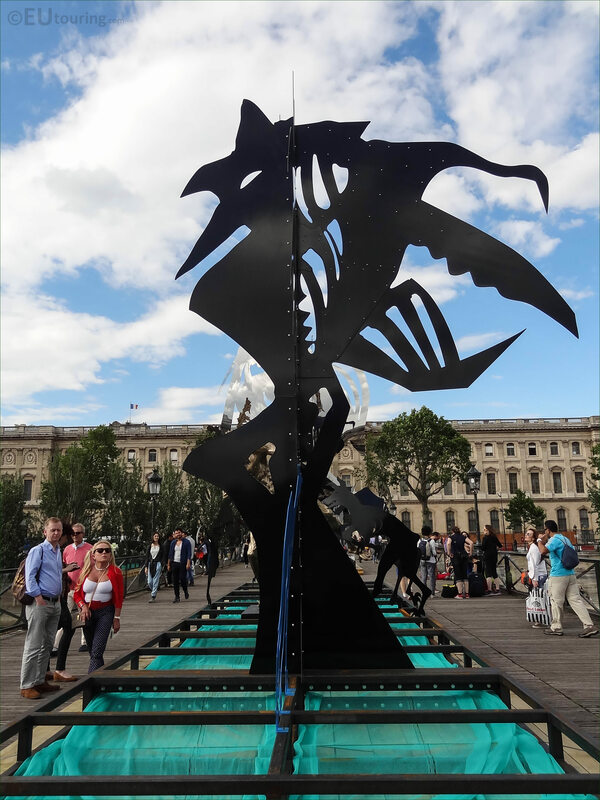 La Passerelle Enchantee translates in English to The Enchanted Footbridge, which is a temporary art installation on the Pont des Arts, with numerous different statues and sculptures that were all designed by the French artist Daniel Hourde. 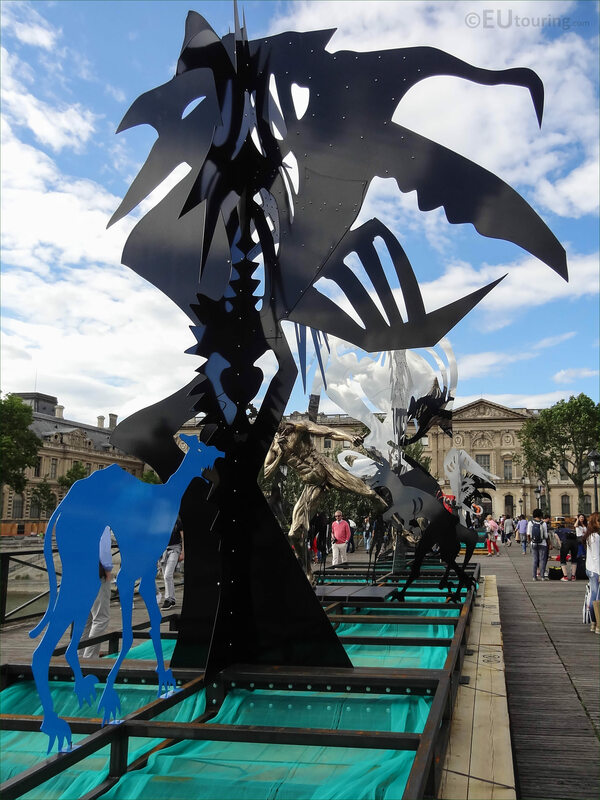 Daniel Hourde came up with an idea for the exhibition based upon the original concept of the Pont des Arts being a suspended garden where people could promenade over the River Seine between the Institut de France, which you can see in the background, and the famous Louvre Museum. The garden idea did not last, as it was not practical to maintain, but the artist wanted to provide a transition between what the footbridge started to represent with its padlocks and what it is now as a place of culture and art, therefore, this is why you will see several different tree sculptures. 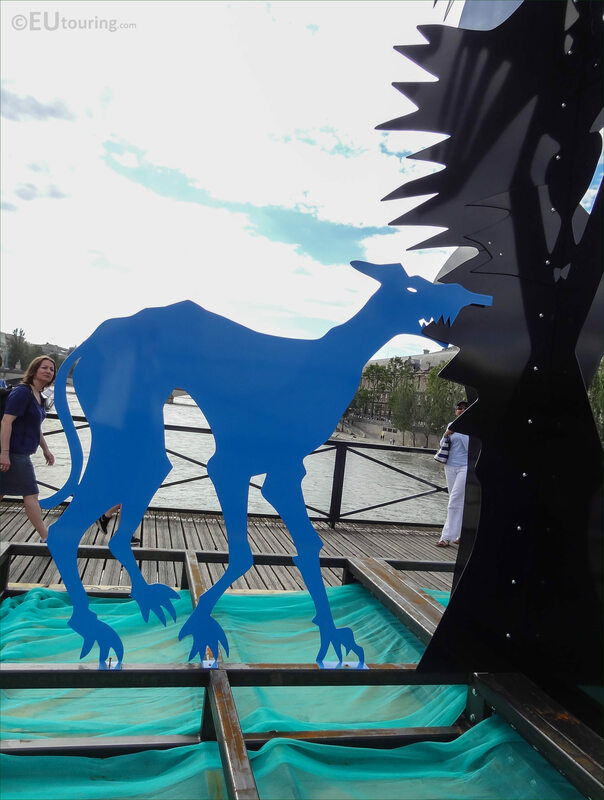 Tree 6 was actually sculpted at the start of 2016 in steel, then coated with black lacquer, yet here you can also see another sculpture in blue, designed to be like a dog or wolf, and both of these animals are portrays in other sculptures Daniel Hourde produced for La Passerelle Enchantee exhibition based up myth and magic. 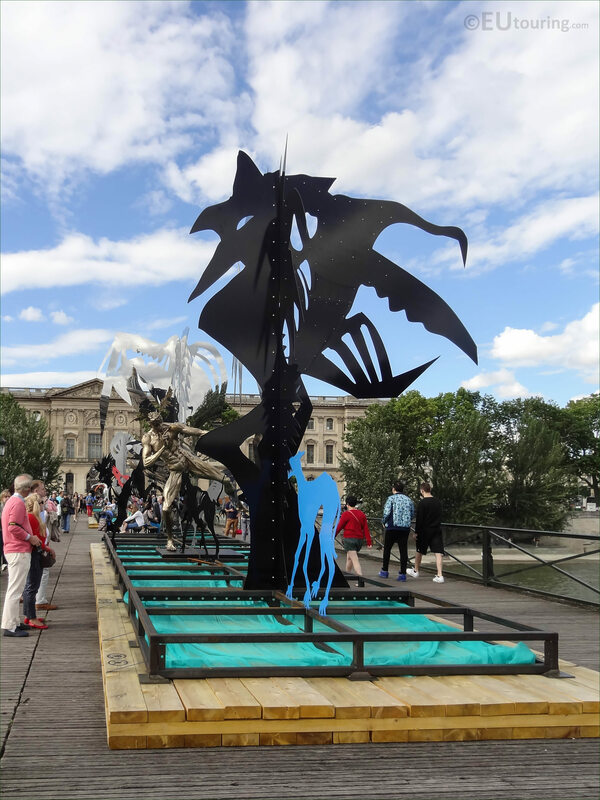 So as you can see in this image, platforms were set out on the pedestrian bridge at intervals along its length with different sculptures and statues on each, created using different types of metal, which was also another theme for the transition from the Pont des Arts being referred to as the Bridge of Love with its padlocks. 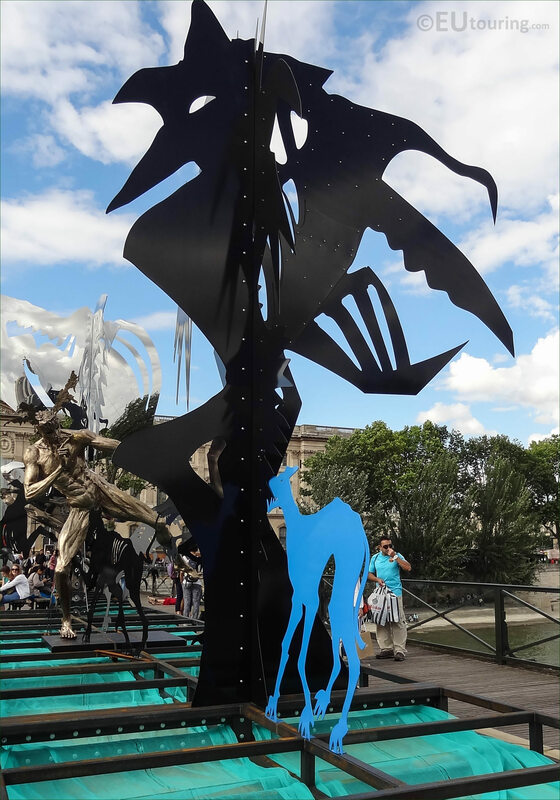 And the City of Paris along with Daniel Hourde want people to still admire the bridge and its views, with the lovelocks having gone and been replaced with plexiglass panels, but to also still be enchanted and enjoy the historical footbridge for what its name represents with temporary art installations like what used to happen on the Pont des Arts several years ago.